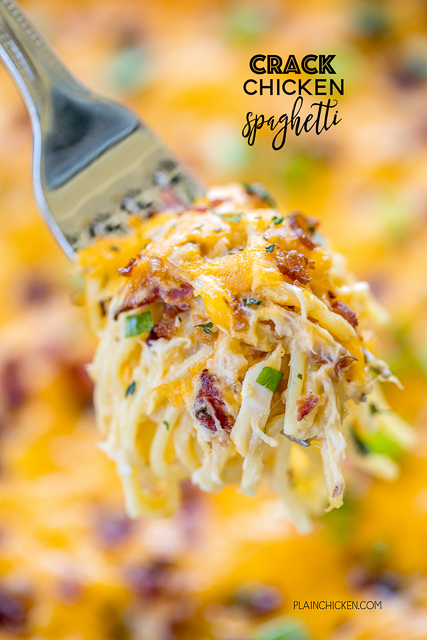 Crack Chicken Spaghetti - chicken spaghetti loaded with cheddar, bacon and ranch. This stuff is totally ADDICTIVE! We make this at least once a month. Everyone cleans their plate, even our picky eaters! Chicken, cream of chicken soup, velveeta, ranch dressing mix, bacon, cheddar cheese, spaghetti. Can make ahead of time and refrigerate or freeze for later. A real crowd pleaser! We are totally addicted to this Crack Chicken Spaghetti! OMG! SO good! Chicken spaghetti loaded with cheddar, bacon and ranch. My all-time favorite flavor combination! Just in case you are new here, I came up with the Crack flavor way back in 2007. 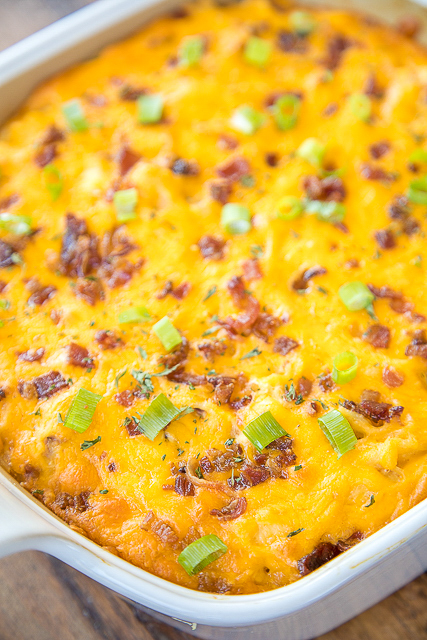 It all started with a dip made with cheddar, bacon and ranch mix. I made the dip for a tailgate and everyone went crazy for it. Nobody could stop eating it and they said it was like crack. Hence the name, Crack Dip. I now take those flavors and "crack out" all my favorite foods. This Crack Chicken Spaghetti can be made ahead of time and refrigerated or frozen until you are ready to serve. If you freeze the dish, make sure to thaw it in the refrigerator before baking. We LOVED this Crack Chicken Spaghetti. I have actually made it a few times over the last month and it has been a hit every single time! It tastes great right out of the oven and reheated the next day. I used rotisserie chicken for the chicken in the casserole and it came together in a snap! I boil the noodles and get the sauce going at the same time. By the time the noodles are done, the sauce is ready. Just toss together and throw it in the oven. SO easy! In a saucepan, combine cream of soup, Velveeta and chicken broth. Cook on low, until the cheese melts, stirring constantly. Stir in dry Ranch mix. Stir in cooked spaghetti, cooked chicken and bacon bits. Pour mixture into prepared dish. Top with cheddar cheese. Bake uncovered for 30 minutes or until heated through. Could I substitute something for the Velveeta? My boyfriend is not a fan. I was going to ask the same question. Any good substitute ideas? I only make this with Velveeta. In the 1980s, Velveeta used the advertising jingle, "Colby, Swiss and Cheddar, blended all together" in its US television commercials to explain its taste and texture, because at that time genuine cheese was used in its recipe. So I would imagine you could use those? It's worth a shot. Here's the 'cheesy' commercial LOL. Try using Kraft Old English sharp cheddar slices. It is processed like Velveeta but is better to me. Gonna try this using Kraft. Here is a recipe for homemade velveeta that is less processed. https://www.browneyedbaker.com/diy-homemade-velveeta-cheese-recipe/ I plan on making this with that and my homemade cream of celery soup too. Looks so yummy! It looks like you added green onions or chives or something but I don't see it on the list. I'm not a fan of 'green things'...family joke with me lol...unless it is like sweet peas, green beans, cucumbers and lettuce...otherwise no green things lol. We make this recipe a lot at our house. OMG... it is yummy! And for all those who are questioning the Velveeta: if you don't care for Velveeta, use what you like! At different times, I've made this recipe with mozzarella, cheddar, and I've even used a couple pkgs of cream cheese instead of the Velveeta... and it was always fantastic! Use the recipe as a starting point, then add what you love! If you love asparagus, add it! If you love the crunch of celery, add it! This is a great base recipe & you just can't go wrong. YUMMY!! I love RN (^_-) it's 1am ...I can't wait!!! Is any type of pasta ok to use? I've only made it with spaghetti. It should be fine with 8oz of your favorite pasta though. Enjoy! Do you have any suggestions on making this a make ahead meal for the freezer? Would I thaw before baking it? I usually thaw it overnight in the refrigerator. Why bacon bits instead of actual bacon? I did use actual bacon. I just used pre-cooked bacon. Ok,in the ingredients list it says bacon bits and I thought you ment those things in a jar. They do make an 8-oz package of Velveeta. If you can’t find it - you can use 2 of the new 4-ounce blocks or half of the pound block. I'm sure you could, but I haven't tried this recipe in the instant pot. If you try it, let us know how it worked. I'm pretty sure this in a crockpot would be delicious but I would add extra cream of chicken soup so it wouldn't dry out. I like Velveeta but it's a little salty for me. I would mix it with Colby and sharp cheddar. And definitely use a small amount of green onions. Can't wait to try it on my coworkers! I made this yesterday for my Momma and I. It is sssooo yummy and very easy to make. This is a keeper!!! This is definitely dinner tonight. I just wanted to ask if anyone else is getting a huge gap between the ingredients and directions. I end up using two sheets of paper instead of one. This was good next time I will add Rotel to give it a different favor. roaster and bake the next day? If you double it and cook it in a 9 x 13 pan would the baking time be the same? Can you make it ahead and refrigerate it and bake it the next day and if so how much time would you add for it being cold??? I just made this and it’s super good! I made substitutions though, because I didn’t have velveeta. I used extra sharp cheddar and some motzarella. Then once everything was melted and bubbly, I added a big scoop of sour cream. Turned out great! I will try it again with velveeta next time! Thanks! This is one of my favorite new recipes! Of course, I never have dry ranch so I just squeeze some from the bottle. I never have velveeta either so I throw in whatever cheese I have. Usually colby jack & cheddar. I've also thrown in pepper jack, provolone, and 1 piece of american (real). (I'm from Wisconsin!) Either way it makes a nice creamy sauce. Funny, I just ate some for breakfast and lunch today. Thanks!